MARY ANN in Marigold- 8 Scallops. 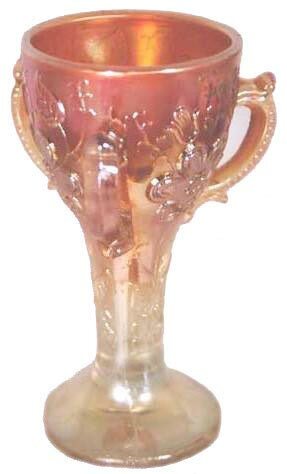 MARY ANN: This vase does not appear in any of the known wholesale catalogs until 1915, placing it into the Diamond era of production. 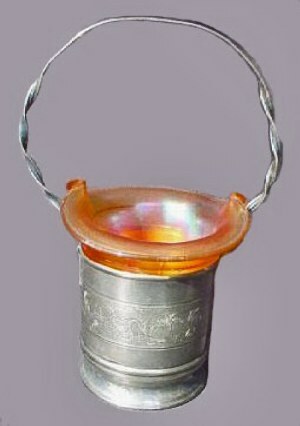 Two carnival versions of the vase are known. This two handled type is seen more often. 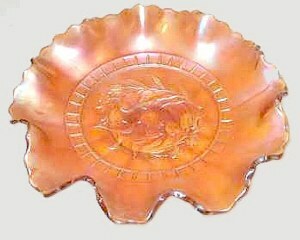 It has eight scallops on the top edge and rests on a pedestal foot. Only marigold and amethyst are known, with marigold seen more often. Few amethyst examples surface. A few marigold vases turn up having ten scallops along the top edge. Occasionally, a blue opalescent non-iridized two-handled version is found. 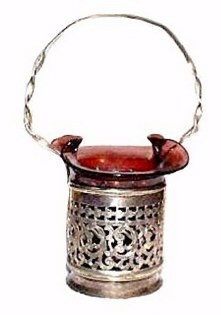 It is the three-handled vase in this pattern which stirs buyers with enthusiasm. 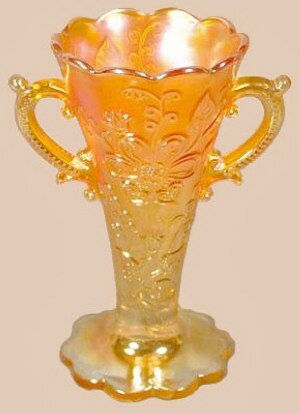 It is called a Loving Cup and has been reported only in marigold. It is much more rare than its two-handled counterpart. 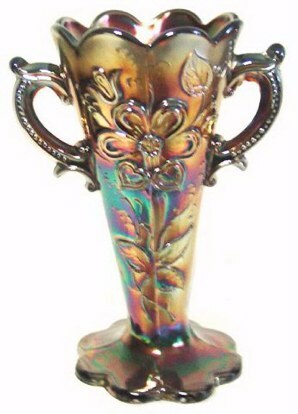 The original factory mold drawing for the Mary Ann vase was discovered at the site of the former Diamond Glass Company, ten years after the destructive 1931 fire. 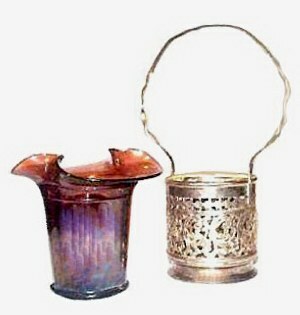 NOTE: The two-handled vase has been reproduced in iridized pastel blue and appears for sale over eBay quite frequently. 4 in. tall x 4 .75 in. wide. 8.50 in. to top of handle. marketed in a different metal basket. 7.5 in. across x 3.5 in. high. WINDFLOWER: The original factory mould drawing was discovered at the Indiana, PA site ten years after the 1931 fire which closed the plant. 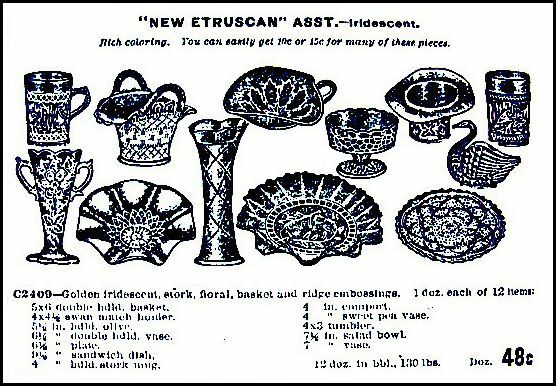 The design debuted in the spring of 1915, as part of the Etruscan iridescent novelty assortment shown in Butler Brothers wholesale catalog. Since the handled nappy is known in ice green, we know that production extended into 1921 when Diamond introduced its iridescent pastel green line. Considering its extended popularity, it is no wonder so many examples remain available today. Three shapes are known. The 7 ½”-9” collar-based bowls are plentiful in marigold. Amethyst examples may be somewhat more challenging, with cobalt blue examples more difficult to find. 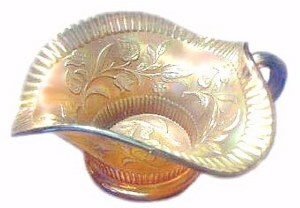 Most bowls are ruffled, with just a few ice cream shaped examples. 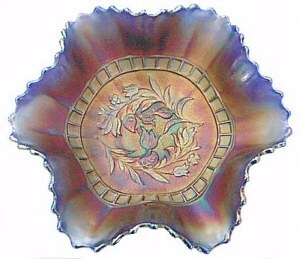 8”-9” flat plates are not easily obtained, with amethyst more difficult than marigold. Cobalt blue flat plates should be considered rare. 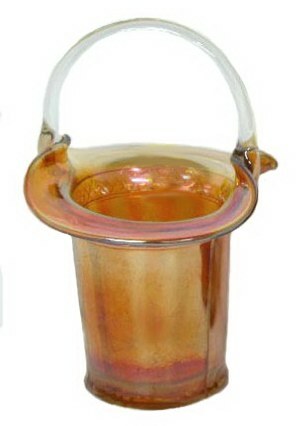 The large, single-handled-nappy, usually spade-shaped, are available in a wider range of color: marigold, amethyst, cobalt blue, lavender, ice green and peach opalescent. Cobalt blue should be considered rare. 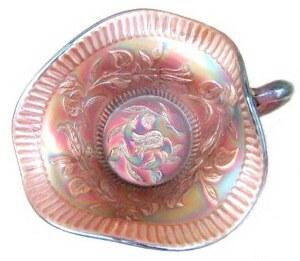 A choice few ice green nappies are known, and rarest of all are the peach opal examples. (To view an ice green nappy, please click on ~~ ~~ in our homepage pattern alphabet). Let the lowly brother glory in his exaltation, but the rich in his humiliation, because as a flower of the field he will pass away. For no sooner has the sun risen with a burning heat than it withers the grass; its flower falls, and its beautiful appearance perishes. for when he has been approved, he will receive the crown of life which the Lord has promised to those who love Him.